MOG-specific and AQP4-specific antibodies (Ab) target 2 different CNS resident cell populations, the oligodendrocyte (Olig.) or the astrocyte (A), respectively. Data indicate that antibodies are produced outside the CNS in both MOG Ig+ AQP4-seronegative opticospinal inflammatory disease (left) and AQP4-seropositive neuromyelitis optica spectrum disease (NMOSD) (right). AQP4-specific antibodies are IgG1, an antibody subclass that requires assistance from antigen-specific T follicular helper (Tfh) cells when B cells differentiate into plasma cells.49 Anti-MOG antibodies appear as IgG in the diagram, although the antibody isotype is currently unknown. Serum antibodies to either MOG or AQP4 alone are not considered pathogenic in the absence of a cell-mediated inflammatory response. 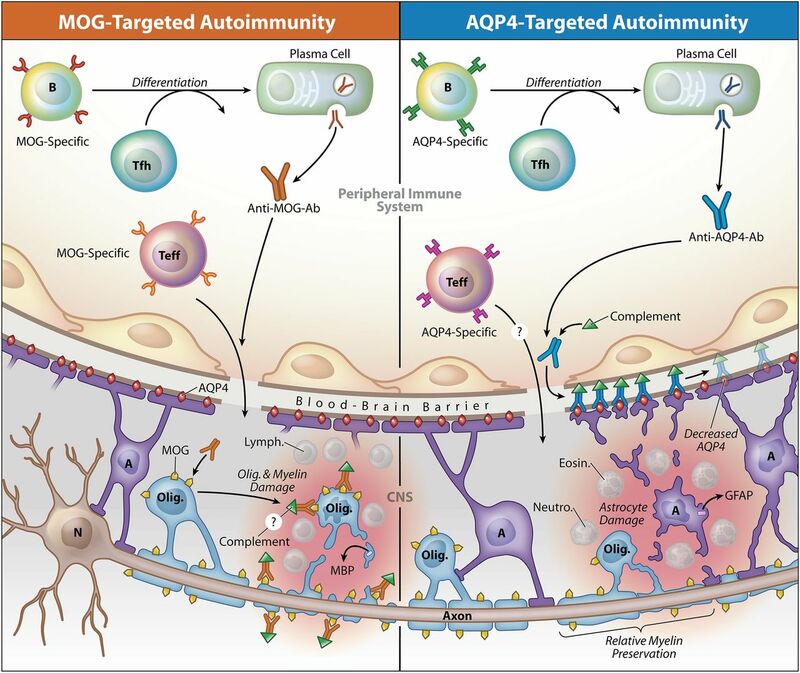 MOG-specific T effector cells (Teff), like in experimental autoimmune encephalitis (EAE)50 and possibly in multiple sclerosis (MS),51 or AQP4-specific Teff cells,41 might initiate CNS inflammation, which in AQP4-seropositive NMOSD is characterized by accumulation of neutrophils (Neutro.) and eosinophils (Eosin. ).22 Lymphocytes (Lymph. ), which are characteristic in MS25 and MOG-induced EAE lesions,29,52 are shown in MOG Ig+-associated inflammation, although their presence has not been confirmed. In both conditions, inflammation may disrupt integrity of the blood-brain barrier, permitting entry of antibodies.37,39,40 MOG-specific antibodies presumably bind MOG expressed on myelin-forming oligodendrocytes and myelin, a layer that surrounds the axons extending from neuron (N) cell bodies. While the precise contribution of MOG-specific antibodies to MOG Ig+ opticospinal inflammation is yet unknown, MOG-specific antibodies promote demyelination in EAE37 and have been identified in MS lesions.24 Damage to oligodendrocytes or myelin may be associated with release of myelin basic protein (MBP).46 AQP4-specific IgG1 binds to AQP4 water channels, which are abundant on astrocyte end-feet processes. AQP4-specific IgG1 fixes complement, which amplifies astrocyte injury. Glial fibrillary acidic protein (GFAP) may be released upon injury to astrocytes.46,47 AQP4-targeted damage of NMOSD is associated with relative preservation of myelin.22 Copyright XavierStudio, reprinted with permission.